I’ve gotta admit to being surprised by this chart from the Economist showing that there are now 3 times more mobile phones in the developing world than the developed world. Look, A Happy Mobile Customer! Mobile-phone subscriptions in poorer countries accounted for just a quarter of the global stock in 2000, but had risen to three-quarters of the 4 billion total by the start of this year. Anyone want to take a guess as to why this incredible growth? C’mon, it’s quiz night, pick one. It’s cheaper to set up mobile infra-structure compared to POTS land lines. 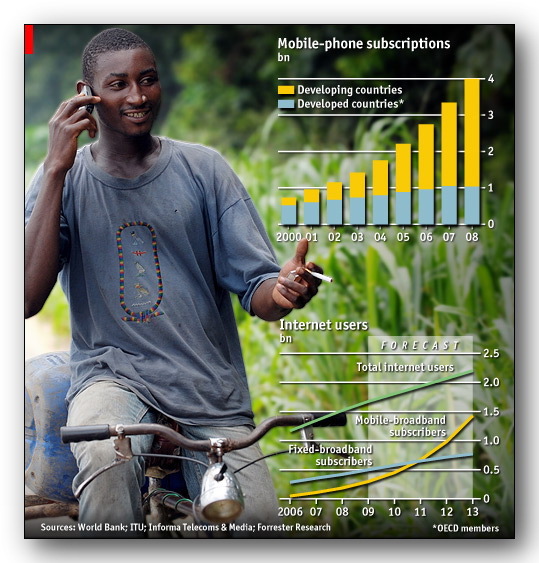 Mobile phones are much cheaper in developing countries than developed countries. People in developing countries like to talk more than those in developed countries. People in developing countries can text faster than their developed counterparts. ATT is not one of the service providers in developing countries. Right, I know I shouldn’t pick on ATT. Their service is fantastic, they support net neutrality, and their billing is crystal clear with no hidden fees or charges mis-labeled as federal taxes. If we get really lucky Google will buy them as a ‘pity investment’. In South America anyway, using a cell phone costs a fraction of what it costs here. Hmmm… infrastructure costs the same, so maybe someone is making lots of money off us?